In the run up to our trip to Palmanova for my friend's Hen Do, as I mentioned yesterday I am starting to have a think about what I will need to take with me! There will be several posts dedicated to this such as essential beauty items.. the capsule wardrobe etc but this post is based on the one themed night we are having which is Groupie's Night! All of the ladies have to wear a band t-shirt of their choice, so obviously I have taken this one step further and am planning my full outfit! 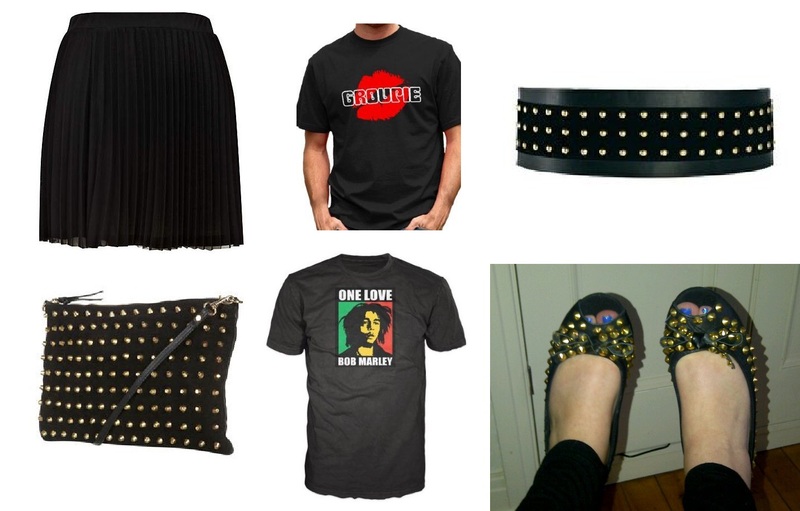 I have interpreted Groupie's Night to include quite a bit of black, big hair and studs.. hence the abundance of them in my potential outfit choice! I already own the little black skirt, which was a purchase from River Island and I also own the shoes which were the very first thing I bought when I got made redundant last year! They felt like a bit of a splurge at the time as they were 65 pounds from Office which felt quite alot to spend! I still absolutely adore them though and have worn them to death so I suppose they were worth every penny! I am trying to decide between T-Shirts.. I have looked specifically for men's T-Shirts as I want to do a bit of customising and cut the arms off etc and in my experience cheaper ladies T-Shirts can come up really small but I don't know whether to opt for the 'Groupie' T-Shirt to spell out exactly what we are trying to look like or to get a T-Shirt with my favourite singer of the moment (or at least who seems to be on my iPod the most!) which is Bob Marley! Perhaps you guys can help me decide? We then come onto the studded items, for those of you who shop at Topshop you will probably have seen this bag.. it is suede with lots of lovely stud detail! I am thinking this will be a good bag to take on Holiday anyway as it zips up and is a good size for all the odds and ends I seem to carry with me on a night out! The belt I am not 100% sure on.. think it could look quite cool with the t-shirt tucked into the skirt but it could be stud overkill with the bag and shoes aswell! What's the best/most difficult themed night you have ever had to dress up for?